Sometimes when you fall off your horse, the next best thing is to get back in the saddle. In many respects, that's what Bledi Bardic did during the New York Cosmos' 4-0 victory over Hofstra University at Hofstra Soccer Stadium on Friday night. On the same field in which he incurred a season-ending pulled hamstring last year, Bardic scored a goal to mark a triumphant return. Needless to say, Bardic was pleased. "You say, 'Hey, I want to beat that," he said. "I got injured. It was important." Bardic came on at halftime and drilled a hard shot into the net in the 61st minute. 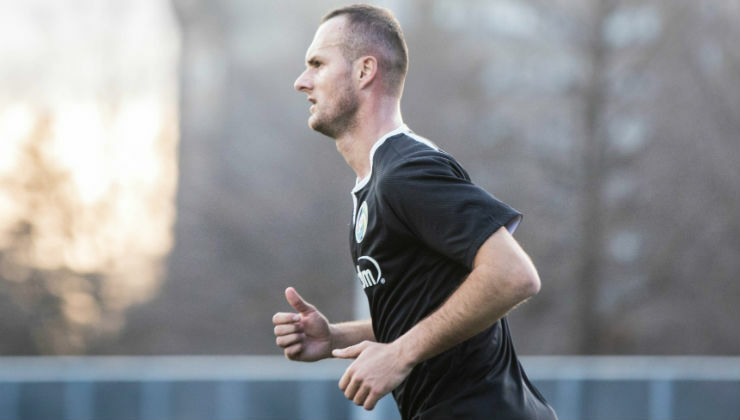 During the North Atlantic Conference Semifinals of the National Premier Soccer League playoffs, the 27-year-old Bardic tallied twice in the opening half before he suffered his injury early in the final half of the Cosmos' 4-2 home victory over the defending champion Elm City Express. "I got injured. Worst case scenario," Bardic said. "It happened. You have to take it and you move on. I moved on and thank God I am feeling good, playing a fall season and now here." Bardic played with Cedar Stars Academy in the Cosmopolitan Soccer League during its fall season, tying teammate Chris Katona with a First Division best 16 goals as he retained his scoring touch and regained his fitness. On Friday night, he and his Cosmos teammates showed they had not lost their scoring touch as well. "It was most importantto go out there and get the fitness," Bardic said. "As a player, I want to score every game and assist and help the team any way I can help. So, it was important to get on the scoresheet." Last season Bardic led the Cosmos with an impressive 12 goals in 11 games. "It's very important for attack-minded players to get around the goal, to finish their chances," head coach Carlos Mendes said. "Bledi's a guy who will give you a 100 percent every game. He sees the goal, he's got eyes for the goal. To get that confidence, the rhythm back, is very important. Not just for Bledi but for all attacking players. He's a guy who will work all day. If he continues to improve on the tactical things, I think that will put himself in better spots and even more opportunities. He's going to be a big piece for us and I'm happy for him to get a goal, especially after coming off the injury." Against Hofstra last year, the Cosmos suffered a 3-1 loss. This year the result was turned around. "We have some things to work on, but overall very happy with the guys, the effort, the attitude," Mendes said. "These games are never easy. For the first time the guys getting out there in a real game, the level was good. we have some things to work on, but overall very happy with the guys, the effort, the attitude. These games are never easy. Very happy." During a half-hour span in the opening half, the Cosmos struck for three goals. Darwin Espinal got the team on the board, rifling home a shot in the 13th minute, Ricardo Bocanegra doubled the lead with a line drive from the top of the penalty area in the 38th minute before Aly Hassan made it 3-0 in the 43rd minute. Every player played a half a match as the Cosmos deployed two different teams in each half. "I felt good," Bardic said. "Fitness getting up there. We moved the ball well, created chances, scored goals, should have had more goals. This is a very good team. We just got to build from it, day by day." Several trialists acquitted themselves well, leaving Mendes to make some tough decisions in the coming days and weeks as to which candidates to sign. "It made it more difficult," he said. "The good thing is that we have a couple of games coming up. We have a long preseason, a full preseason where we can really get to see guys and understand. So, I think we're in a great situation. It's a good problem to have when you have a lot of players, guys competing for spots. It makes our decision, my decision, difficult. But that's what you want as a coach, as a staff."